On going through Ian Flemings’s papers after his death a partly written manuscript for another James Bond story was found. 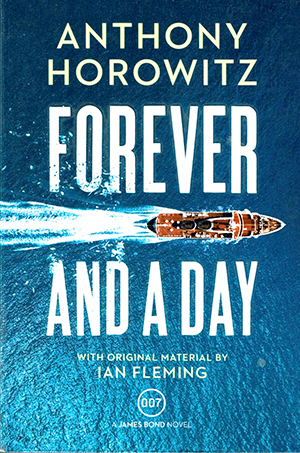 Fleming’s estate approached Anthony Horowtz with the suggestion that he complete the James Bond novel using the story as outlined and incorporating the already written work. ‘Forever and a Day’ is the resulting novel. The story is set pre Casino Royale, Fleming’s first James Bond Novel, filling in Bond’s previously unexplained background. It has not been revealed how much of the completed novel is Fleming’s and there are no clues. Anthony Horowitz has seamlessly mingled his own writing with Fleming’s material to produce a typical James Bond adventure. Fast paced with one unlikely adventure after another, it makes for a very exciting read, even if it does require turning off the reality check. With the many action sequences it would seem that the author and Fleming Estate had one eye on the film industry. Whether Horowitz has even out done Fleming when it comes to escaping impossible situations is difficult for me to say as I have only read the earlier novels, Dr No and To Russia with love. These were more grounded in reality than it appears his later Bond novels. I have to say that when it comes to spy stories I prefer Le Carre to Fleming but that’s purely a personal preference. I am sure that for the millions of Fleming fans Forever and a Day will be a welcome, unexpected, addition to Fleming’s Bond series.